If you grew up in the 80s, you knew about Metal Gear for the Nintendo. It was tricky, your character Solid Snake was a veritable icon of stealth and firepower and your dreams were filled with guard dogs you’d accidentally alerted that were now chasing you. Shootouts like this one are a common part of the action in Metal Gear Solid Touch -- impressive graphics, but none of the stealth-based action fans expect. Years later, Konami has brought the look and feel of Metal Gear to Apple’s iPhone and iPod touch handsets via Metal Gear Solid Touch. Following the plot for Metal Gear Solid 4: Guns of the Patriots, MGST breaks from being a stealth-focused game to become a third-person shooter in which Solid Snake must fight various Private Military Corporation (PMC) soldiers while on his quest to assassinate Liquid Ocelot. Metal Gear Solid Touch is a marquee title and it shows. Lovingly detailed graphics and environments bring the Metal Gear characters and feel to life. Outstanding music and sound adds to the dark mood of the game. Additional touches include sand and dirt kicking up after a rocket has exploded nearby, needing to be cleared by shaking the handset. It all contributes to the sense of immersion. Konami knew the iPhone’s touchscreen was the platform’s distinguishing factor and made the most of it, but the end result appreciably breaks away from what you’d expect of a Metal Gear title. 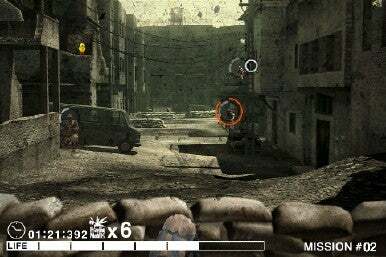 As the level begins, Snake is situated behind cover and must shoot a certain number of soldiers or take down a boss to advance to the next level. In order to fire, tap the touchscreen, move the crosshairs over the enemy, and begin tapping to rapidly fire at a target. For longer distance targets, pinch the touchscreen with two fingers to access the sniper rifle, move the crosshair over the enemy, and take a shot by tapping the touchscreen. Additional weapons like rocket launchers can be picked up, as can health and bonus points (by shooting frog and duck statues along the way). Goodies can be unlocked, like character art to use as iPhone wallpaper, and a Survivor game mode in which you endure wave after wave of enemies. Fans of the Metal Gear universe may love seeing their favorite characters and environments), but Metal Gear Solid Touch has some very big problems to contend with. The game’s controls can feel awkward. The gameplay can feel like a repetitive version of “Whack-A-Mole:” Enter a level, shoot soldiers, finish the level, repeat. This can be fun initially, and the plot is interesting, but Metal Gear Solid players expect a stealth-centered title and this is not it. Konami’s apparently rushed to create a more accessible shooter title, and one that costs $8 at that. On the upside, the application runs well and automatically saves your progress. Hopefully it can evolve into something that much better with a few software updates. Metal Gear Solid Touch requires iPhone OS 2.0 or later to install and run.